Proto-oncogenes normally regulate cell division, but can be changed into oncogenes through mutation, which may cause cancers to form. Proto- oncogenes positively regulate the cell cycle. Mutations may cause proto-oncogenes to become oncogenes, disrupting normal cell division and causing cancers to form. Some mutations prevent the cell from reproducing, which keeps the mutations from being passed on. If a mutated cell is able to reproduce because the cell division regulators are damaged, then the mutation will be passed on, possibly accumulating more mutations with successive divisions. The genes that code for the positive cell cycle regulators are called proto-oncogenes. Proto-oncogenes are normal genes that, when mutated in certain ways, become oncogenes: genes that cause a cell to become cancerous. There are several ways by which a proto-oncogene can be converted into an oncogene. Consider what might happen to the cell cycle in a cell with a recently-acquired oncogene. In most instances, the alteration of the DNA sequence will result in a less functional (or non-functional) protein. The result is detrimental to the cell and will likely prevent the cell from completing the cell cycle; however, the organism is not harmed because the mutation will not be carried forward. If a cell cannot reproduce, the mutation is not propagated and the damage is minimal. Occasionally, however, a gene mutation causes a change that increases the activity of a positive regulator. For example, a mutation that allows the Cdk gene to be activated without being partnered with cyclin could push the cell cycle past a checkpoint before all of the required conditions are met. If the resulting daughter cells are too damaged to undergo further cell divisions, the mutation would not be propagated and no harm would come to the organism. However, if the atypical daughter cells are able to undergo further cell divisions, subsequent generations of cells will probably accumulate even more mutations, some possibly in additional genes that regulate the cell cycle. 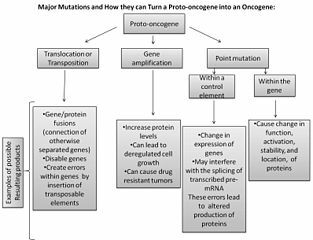 Proto-oncogene Conversion to Oncogene: Examples of ways to convert proto-oncogenes into cancer-causing genes (oncogenes). Tumor-suppressor genes keep regulatory mechanisms of cell division under control and prevent abnormal cell growth. Tumor suppressor genes are segments of DNA that code for negative regulator proteins, which keep the cell from undergoing uncontrolled division. Mutated p53 genes are believed to be responsible for causing tumor growth because they turn off the regulatory mechanisms that keep cells from dividing out of control. Sometimes cells with negative regulators can halt their transmission by inducing pre-programmed cell death called apoptosis. Without a fully functional p53, the G1 checkpoint of interphase is severely compromised and the cell proceeds directly from G1 to S; this creates two daughter cells that have inherited the mutated p53 gene. Like proto- oncogenes, many of the negative cell cycle regulatory proteins were discovered in cells that had become cancerous. Tumor suppressor genes are segments of DNA that code for negative regulator proteins: the type of regulators that, when activated, can prevent the cell from undergoing uncontrolled division. The collective function of the best-understood tumor suppressor gene proteins, Rb, p53, and p21, is to put up a roadblock to cell cycle progression until certain events are completed. A cell that carries a mutated form of a negative regulator might not be able to halt the cell cycle if there is a problem. Tumor suppressors are similar to brakes in a vehicle: malfunctioning brakes can contribute to a car crash. Mutated p53 genes have been identified in more than one-half of all human tumor cells. This discovery is not surprising in light of the multiple roles that the p53 protein plays at the G1 checkpoint. A cell with a faulty p53 may fail to detect errors present in the genomic DNA. Even if a partially-functional p53 does identify the mutations, it may no longer be able to signal the necessary DNA repair enzymes. Either way, damaged DNA will remain uncorrected. At this point, a functional p53 will deem the cell unsalvageable and trigger programmed cell death (apoptosis). 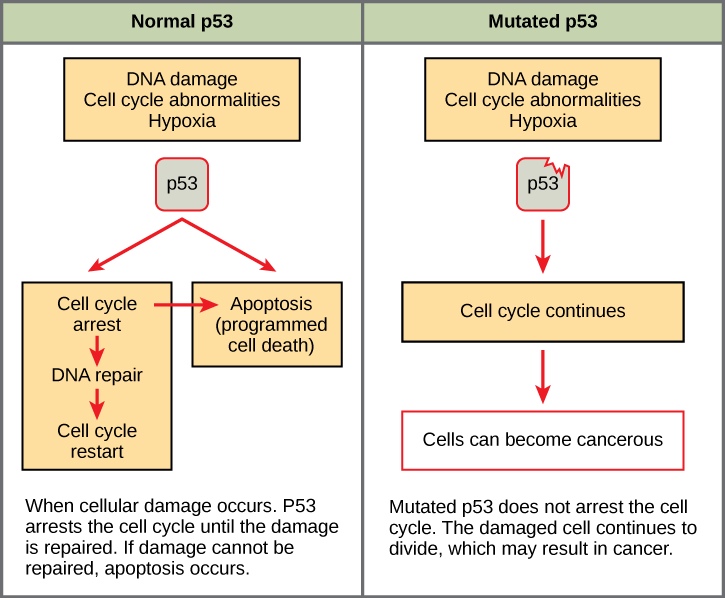 The damaged version of p53 found in cancer cells, however, cannot trigger apoptosis. 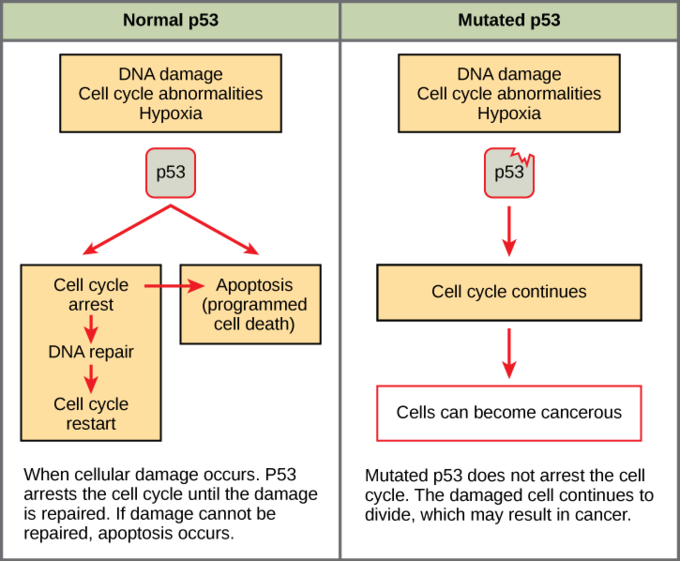 Function of Normal and Mutated p53 genes: The role of normal p53 is to monitor DNA and the supply of oxygen (hypoxia is a condition of reduced oxygen supply). If damage is detected, p53 triggers repair mechanisms. If repairs are unsuccessful, p53 signals apoptosis. A cell with an abnormal p53 protein cannot repair damaged DNA and cannot signal apoptosis. Cells with abnormal p53 can become cancerous.